No holes, frays or patches that allow skin, underwear, or undergarments to be seen are permitted. Spandex or fish net leggings/jeggings should not be worn as stand-alone clothing. Blouses must extend to the end of the shoulder. Anything T-strapped, spaghetti-strapped, halter tops or tank tops must be covered by a jacket at all times. Pleats, vents, slits or buttoned openings cannot be open more than 4” above the knee. No shoes with wheels/roller skates/etc. 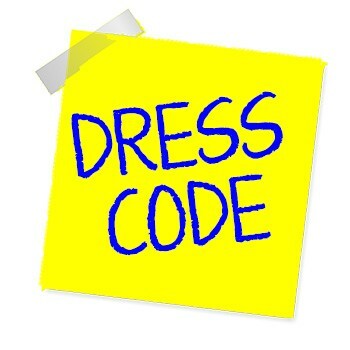 Disciplinary actions will be taken to ensure compliance with dress code requirements. The principal or any other duly authorized school official shall determine whether any particular mode of dress or grooming results in violation of the spirit or intent of this rule.